Thanks so much, Ann! Yeah, unless you’re an American sports fan, you probably wouldn’t recognize him. You might know yesterday’s face though! Hope you’re doing well! Cool! I’ll add it to my awards wall! Thanks so much, Jodi! Right on, lady! I’m actually not a fan of his either, but he has an interesting face! Thanks, Rebecca! I’d be surprised if anyone in Europe knows him, unless they’re really into American sports, but over here, he even does commercials…..and kind of a household name. He has an interesting face, so I thought I’d give him a shot and was happy with it. Glad you like it! You got it, Squid! I’m so glad you recognized him. Thanks! He’s going to the Super Bowl, right? Yes, sir, he is! Way to go! Thanks for playing! No clue who this handsome fellow is but I love your work and I thoroughly enjoy this whole project! You are so talented!!! You are so kind, Johanna! Thank you so much, and I’m so glad you’re having fun with it! I’m really loving these faces, and I feel like I’ve found my groove. Hope to continue this all throughout the year! 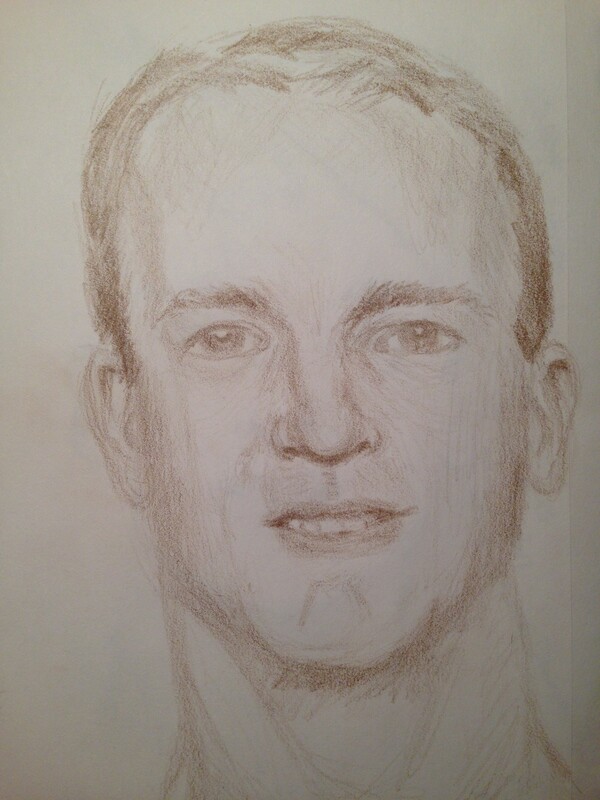 Nope, not from TN, but if you guessed Peyton Manning, you are right! Thanks for your comment, Kim! Football player – Manning – Eli! I get their names mixed up! Oh, double yay! Thanks for letting me know, C! Thanks, Matt! Glad you see him there! Sheesh…where are our fellow football fans sister? I was definitely rooting for him to beat Brady yesterday, but I have to confess, I kinda like Cam too. Hi Laura, a football player? With the initials of PM? Great sketch today. I’m happy to hear you are recovering from the big snow. Happy Monday. You got it, Sharon! Thanks for guessing! We are so glad to be dug out and free as birdies again! Have a great week! I have no idea the identity of the person but since it was Sunday it was probably a football player. You did a great job on the face! Thanks so much, Laura! It’s Peyton Manning. So glad you enjoyed the sketch! He is good looking and good! Thanks so much, Mary! I appreciate it! He looks familiar and you did a great job making it feel rounded and 3 dimensional! Hubby will be watching; but I never watch football with him. 😀 I only watch tennis…and very occasionally basketball. Thanks so much, Lance! It’s Peyton Manning, quarterback of the Denver Broncos. He’ll be in the Super Bowl in a couple weeks because they beat the Patriots in yesterday’s AFC Championship game. We are a little nuts about football in the US…..So glad you visited and I’m happy that you enjoyed the sketch! Thanks, Charlie! Yeah, he’s in lots of commercials, which is one of the reasons I’m no big fan of his lol. But I was hoping most people would recognize him from those, if not from football. He’ll be in the Super Bowl in a couple of weeks! So glad you recognized him! Thank you! All of the practice is helping a lot. There are a couple subjects that seem to elude me. One may post tomorrow 😬 And he’s not an athlete! Glad you’re enjoying them, Charlie! You’re too kind! Thanks Rebecca!